Today was a lovely day of fibery fun, organized by The Yarn Shop. Watching the weather channel last night (rain, rain, rain) I was worried that it wouldn’t happen, but luckily we only got a few sprinkles. The day started out with demos on wool washing, dyeing, and carding. I personally will probably never (well, never say never) raise my own sheep or buy an entire fleece, but it’s still interesting to learn about these processes. One of the ladies actually raises the flowers she uses to dye her yarn (from the sheep she also raises), an idea which I think is pretty cool. 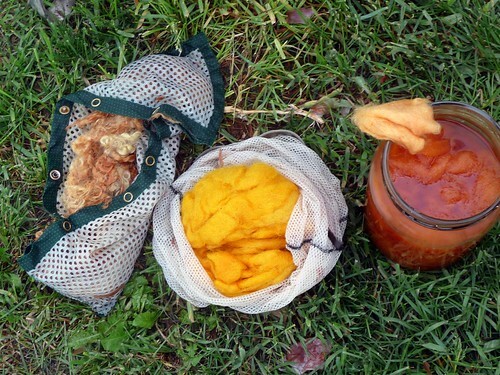 To demonstrate natural dyes, Katey (who used to dye for Thirteen Mile Wool) worked up a dye bath full of onion skins with some interesting results. These samples were put in (respectively), 3rd, 2nd and 1st. The first sample grabbed all of the red colors from the skins, leaving the yellow for the second sample of wool. Both of those samples were mordented (which means they added alum to the wool to get the dye to “stick”). The third sample was unmordented, and perhaps not as technically done since we just threw it in after washing, and it got some leftover natural colors. These ladies suggest that if you do dye with natural dyes that you have lots of fiber on hand because it’s always fun to see how it comes out. Plus, you can always overdye it later. 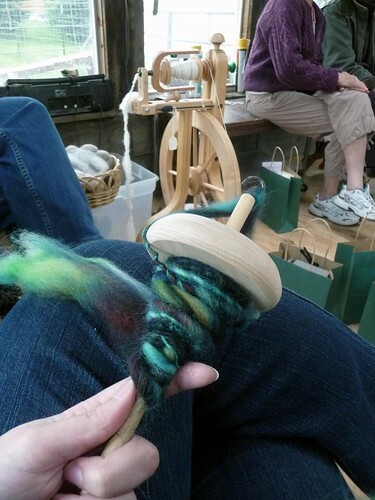 And then- THEN!- I finally learned how to use a drop spindle. I’ve been using all of my restraint to NOT get into spinning or weaving since I started working at the yarn shop, because I just don’t have room for another hobby and all of the materials that go with it. 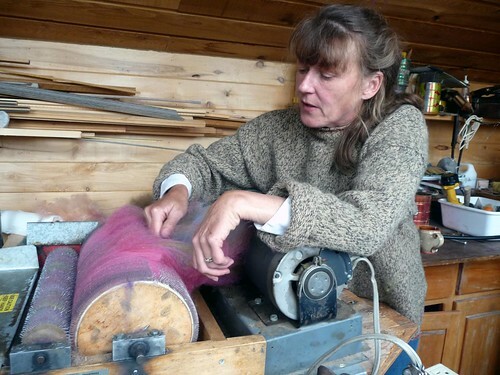 But a drop spindle is quite an inexpensive investment and now I can look at all of the pretty local fibers we stock. Ahem. I started out with this gorgeous Blue Faced Leicester wool from Snake River Fiber Works. I spun up the whole 4 oz once I got home, and I can see spinning becoming a very fun thing to do during downtime when I don’t feel like concentrating on a project. This all sounds very dangerous… but I’ll try to contain myself. 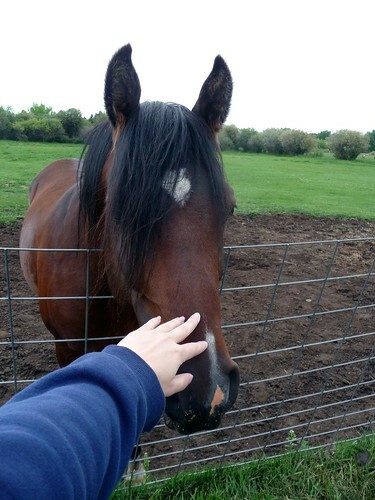 All in all today was a fun, informative day, and one that made me feel grateful to live in Montana. I feel quite fortunate to have met all of these lovely ladies and learned some of their tips and tricks. May - that sounds like such a fun day! I wish I had know about it (I'm in Boulder). I would have definately tried to wrangle DH down to Bozeman! Thanks for sharing your day. This is so interesting! Thanks for sharing. I agree with you, cannot fit another craft into my room that is already groaning under all the stash! I'm so jealous!!! This kind of makes me want to get back into knitting and crocheting... I just need to find a way to make my days 36 hours long instead of the measly 24. That looks like lots of fun!You do realize you are doomed now, you'll have a spinning wheel within a year!There is no escaping the fibre addiction.